Christmas Tree with Garland Neon SculptureI just purchased Tropical Fish Neon Sign from Everything Neon for my home. I wanted to tell you that it is awesome. Received the sign exactly on time and in absolutely excellent condition. My neon sign on the wall besides my aquarium is looking amazing. Thank you for getting me informed all way through from my purchase to delivery. 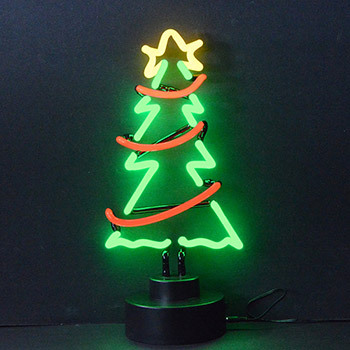 A great way to express your love for the noble game of pool, the Christmas Tree with Garland Neon Sculpture brings a cool and mesmerizing vibe to your home decor. Perfect for your living room, game room or den, this wonderful free-standing neon sign is sure to add character to your living space. This fluorescent sculpture features skillfully hand blown neon tubing, a silent and efficient solid state transformer, and an on and off switch for convenience. A captivating piece of neon art, it comes fully assembled; no wiring required. Made of glass, metal, plastic and electronic components. Assembly level/degree of difficulty: No Assembly Required.